Unfortunately, due to sales rights restrictions, we cannot offer High Speed Tractor for sale in your country. A Visual History of the U.S. Army's Tracked Artillery Prime Movers. 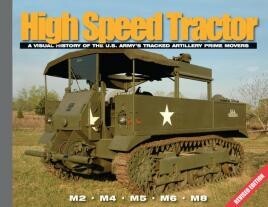 Ampersand Publishing's well-known Visual History Series title on the High Speed Tractor is now back in print and revised! The original title has been improved with new photos and an additional eight pages of material. The revised title is now 120 pages in length and contains 20 new photographs. Coverage includes all aspects of the U.S. Army's tracked artillery prime movers and airfield tugs, the M2, M4, M5, M6 and M8 High Speed Tractors. In addition to plentiful action and field photos; interior photos, engine photos and factory images round out this exquisitely detailed visual history. One hundred twenty black and white interior pages.